Every July, Reno becomes Artown, and High Desert Harmony was thrilled to take part in this annual event once again. On July 30th, we presented an old-time radio show, complete with an emcee, funny commercials, call-in requests, light-up applause sign, and radio jingles. Our “Friends & Family” show was July 23rd, and both nights had big audiences and thunderous applause (thanks in part to that applause sign)! Our newest quartet, Sierra Sirens, debuted on July 30th, with Amy Fleming (tenor), Alana Ridge (lead), Jenny Carr (baritone), and Daria Tavoularis (bass). In addition to all the work before our Artown show, we also performed in May outside of Mountain Music Parlor during Reno’s Midtown Artwalk. 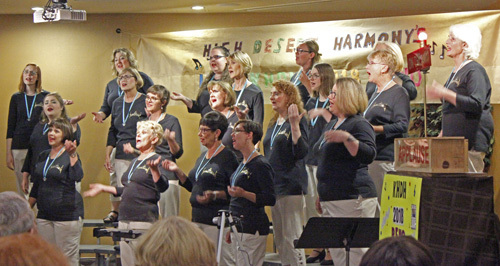 The women of High Desert Harmony had a great time entertaining all who passed by.